For years now I have wanted to be someone who meditates on a regular basis. It’s been on my ever-growing self-improvement to do list. It would be a simple and effective way to improve everyday life and my overall mental and physical health. Except for me, I’ve found it’s not so simple because I just don’t know how to quiet my mind. I know it is a practice and I would improve with time, but I struggle to find that time. Being able to slow down in this busy play-at-home/homeschool life has proven to be a challenge. Given that I have yet to reach a schedule that makes room for daily showers, it is safe to say that I can sometimes fail at putting self-care first. My mom has recently entered into the retirement life. She’s exploring hobbies and settling into a life that is all about her. A few weeks back she mentions to me that she’s going to take up coloring as a form of meditation. After teaching in the classroom, as well as the yoga studio, I have seen the calming and quieting effect coloring can have on children. In the classroom, it would often produce a hush over the room that could make me feel uncomfortable with its rarity. (A silent, focused classroom full of twenty something six and seven year olds is a rare scene!) In the yoga studio, I would invite my little yogis to color mandalas to help them settle on to their mats before yoga began. 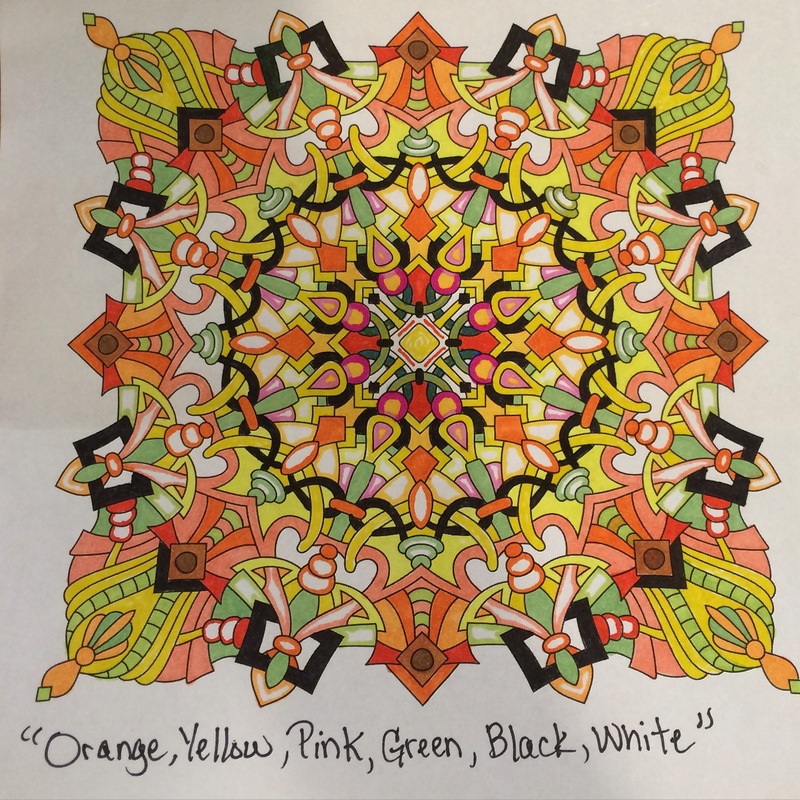 Though it is literally an elementary act, coloring can bring a sense of unexpected peace. Proud of her new pastime, my mom asked the boys for a list of their favorite colors and she dedicated two of her meditative sessions to making something for them. When his piece arrived, Big Brother was so enthralled with the details and colors. He just sat in awe of what she had made for him. A few days later, while we were at our local art store, we found a few meditative type coloring books and along with a box of fresh new colored pencils, we were on our way to trying out some meditative coloring of our own. The first time we sat down we were drawn into this activity for an impressive amount of time. Even with Little One bouncing in and out of the action, we really found a way to both quiet our bodies and minds and just be in the moment. And even though I can appreciate how laughable it can be to find so much peace in a simple child’s act…it’s really working. Big Brother and I have found time, sometimes multiple times a day, to stop and quiet ourselves with coloring. As I fill the small spaces with color, my mind calms and the thoughts slow down. I am left feeling a little more grounded, happy, and as though we’ve just pushed the reset button on our day. I think one of the keys to success of this new discovery for Big Brother often lies in the fact that it is something we’re doing it together. There have been several times he has pulled out his supplies and done some meditative coloring on his own, yet he seems to get more joy and will definitely participate longer when it is an activity we share. It’s the best of both worlds! We have found a way to spend quality time together and I’m able to check off an act of self-care on my list. Progress! The book we have been using is called Doodle Designs. Big Brother has enjoyed a few from this one, which is meant for adults, but I also picked up a few kid versions for him such as Seek, Sketch and Color and Seek, Sketch and Color — Animals which has lots of details to attend to as well as a seek and find game on each page.